CONGRATULATIONS TO DANIELA MAJORIE AKAMA DOS REIS, RECIPIENT OF THE 2018 FCIL SCHAFFER GRANT FOR FOREIGN LAW LIBRARIANS! Ms. Daniela Reis is the 2018 FCIL Schaffer Grant for Foreign Law Librarians recipient. Congratulations, Daniela! The Schaffer Grant Selection Committee chose Ms. Reis in part because librarianship has been the central focus of her education and career from the start. From 2013 to 2016, Ms. Reis was a librarian at a technical school. In 2013 she also worked as an archivist at Medeiros Advogados, a major São Paulo law firm. She holds a bachelor’s in Library Science (2009), a Master’s in Information Science (2012), and is a candidate for a PhD in Information Science at the Universidad Estadual Paulista Julio de Mesquita filho, also in São Paulo. 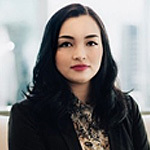 She currently works as a law librarian at the firm of Lobo de Rizzo Advogados Associados, one of São Paulo, Brazil’s leading law firms, with offices also in Rio de Janiero. Ms. Reis has been with Lobo de Rizzo since 2016. A first-time attendee at the AALL Annual Meeting and Conference, Ms. Reis is looking forward to meeting law librarians from the United States and other countries, and she is especially interested in talking with law firm librarians about training and education for firm librarians, as well as advancements in technology. On her return to Brazil, she plans to write about her AALL experience in professional literature. She also plans to share her experience about AALL on social media. The FCIL-SIS welcomes all AALL attendees to Ms. Reis’s presentation. Her topic is academic in nature, using data to explore the paths toward a profession in librarianship in Brazil, with an emphasis on the many current challenges in the training and education of professional librarians in her country. The selection committee hopes her topic will draw others, including firm librarians, from outside the usual FCIL-SIS orbit to hear Ms. Reis speak. She titles her talk: “Professional Profile Survey of the Law Librarian in the State of São Paulo, Brazil”. This is a unique topic and will give a glimpse into library education and training in a huge, diverse, and critically important Latin American jurisdiction. Ms. Reis’s presentation will take place on Monday, July 15, 2018, 4:45 – 5:45 p.m. in the Hilton Baltimore, Third Floor, in the Carroll (A) Room. Please join us in welcoming Ms. Daniela Reis to Baltimore in July! 2018 FCIL Schaffer Grant Selection Committee Members: Mark Engsberg (Chair), Joseph Hinger, Sherry Leysen, and Hunter Whaley. FCIL-SIS gratefully acknowledges the generous contributions of many Donors. 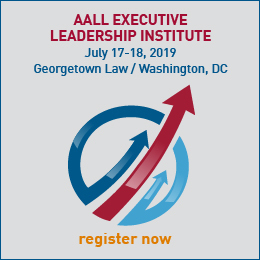 Despite valuable support from AALL, FCIL, vendors, and individual AALL members, the FCIL Schaffer Grant for Foreign Law Librarians Fund at this time does not fully cover the recipient’s transportation, lodging, and food costs. 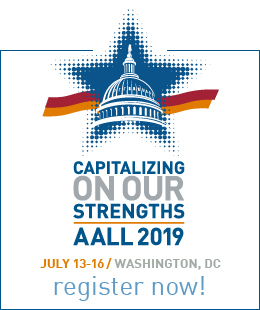 Your tax-deductible donation will enhance the Grant’s impact and ensure the continued presence of foreign law librarians at AALL. Make a Contribution.